Like The Butcher Shop, Annibale Carracci's The Bean Eater does not take its theme from any specific literary or historical anecdote and has a popularesque style. It is a genre scene, meaning a direct observation from daily life. Here, Carracci's simple peasant, in his coarse (albeit clean) clothes and rustic straw hat, sits down to a simple meal of beans and onions. Social codes in Baroque Italy extended as far as to food. According to contemporary thinkers, foodstuffs like beans and onions, which are dark in color and grow low to the ground, were suitable only for similarly lowly consumers, like peasants. On the subject of beans, an Italian writer contemporary to Carracci stated "it should not be used except by those who labor hard. " Food suitable for the aristocracy was light in color, and grew far from the ground, paralleling their elevated, white virtue. Furthermore, it was believed that if a peasant should consume the type of foods intended for the aristocracy, he would fall terribly, terribly ill.
Like Carracci's other early genre paintings, it is not known for whom or why The Bean Eater was painted. It can be presumed that the painting represents a painting exercise for Carracci's personal pleasure. Annibale draws inspiration for many of his early works from fellow northern Italian painters. 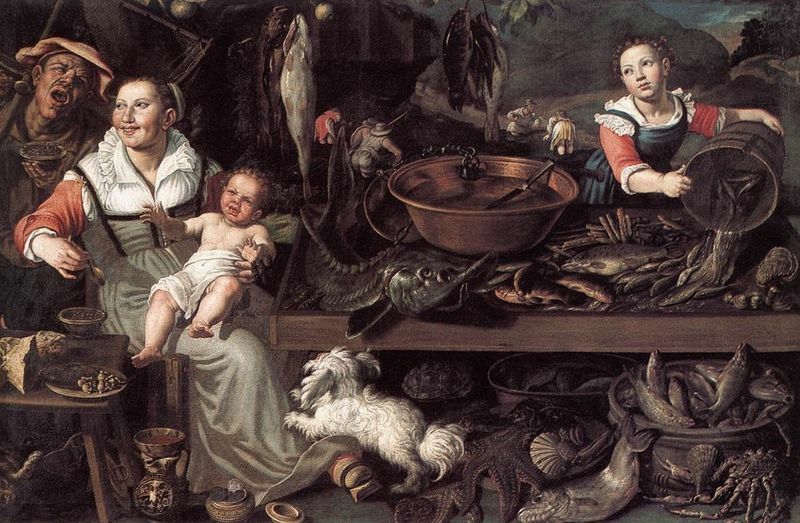 Here, the subject of the bean eater comes from Vincenzo Campi's The Fishmonger. The bean eaters are tucked into the left hand corner of Campi's composition, and dine on exactly the same meal as Carracci's ruddy peasant. The swarthy man's gaping mouth, the voluptuous woman's knowing grin and the wailing child all seem to suggest a lascivious theme, and indeed foodstuffs such as beans, leaks and onions were seen as aphrodisiacs in the 17th century. 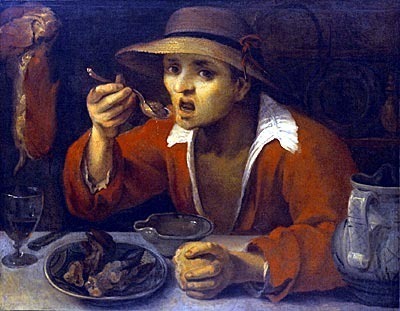 Although Annibale borrows the subject of bean eating from Campi, his representation of the subject is completely different. 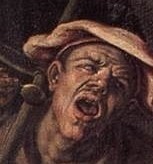 There is nothing comical or lewd about Carracci's peasant. He is coarse and slightly unkempt, certainly, but not in the least ridiculous. Artist's fascination with scenes of modest, everyday life has long been of particular socio-cultural significance. This resulted in the development of the so-called "genre" scene, already apparent in 15th century Franco-Flemish tapestries and in works by both Willem Beuckelaer and Pieter Aertsen in the mid-16th century. Schools in northern Italy which had always welcomed Flemish influences, for example, showed a real interest in the realism of the genre. One of the most remarkable aspects of Carracci's The Bean Eater is the moment the artist chose to depict. Annibale has captured an utterly real, transient moment, where the peasant is just raising a spoonful of beans to his lips, only to stop, surprised, by the intrusion of the viewer. The peasant dominates a large portion of the canvas, possibly reflecting the important Carracci attributed to him as the subject of this piece. 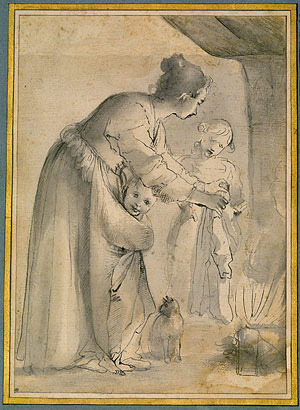 Art historian Donald Posner, the man who helped to restore Carracci's reputation in the mid-20th century, has described the composition as a "snapshot" effect which was utterly unprecedented in Western art. One of the main characteristics of Annibale Carracci's style, The Bean Eater is like a manifesto of Carracci's early naturalism. Carracci shows the dirt under the fingernails even before Caravaggio, and his observation of the still-life elements reveals careful first-hand study. The simple composition of this piece lacks sophisticated perspective or spatial structure and not evidencing any skills serves to make this piece more compelling. Like his other paintings from the 1580s, in The Bean Eater Carracci employs a sober, restricted palette of brown, green and gray tones, in keeping with the colors of the foodstuffs. Annibale adopts a novel, thick, broken brushstroke which is commensurate with his relatively rough, coarse subject matter. Many critics &ccedizzz;ompare The Bean Eater to works by Caravaggio and Velazquez containing members of the lower class. Caravaggio's The Supper at Emmaus also features a loaf of bread almost that same as depicted in The Bean Eater. Yet, despite such similarities there is a difference in the way these work are painted. 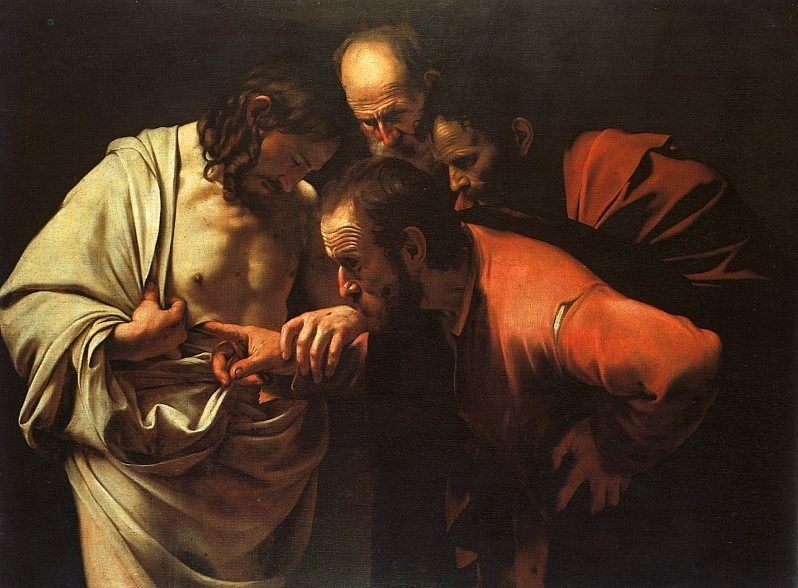 There is a great smoothness to the works of Caravaggio and Velazquez in terms of their gradations. The brushwork is refined and skillful. 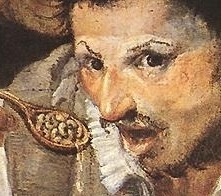 Carracci's style is more rugged and his painting is rough and more haphazard. 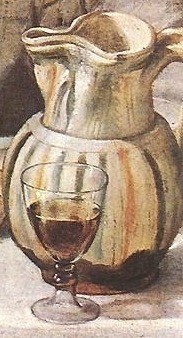 Certain elements of The Bean Eater are finished with black outlines such as the fingernails. There's sketchiness to the artist's work. Carracci was among the first Italian artists to depict scenes like The Bean Eater, inspired by mundane scenes. 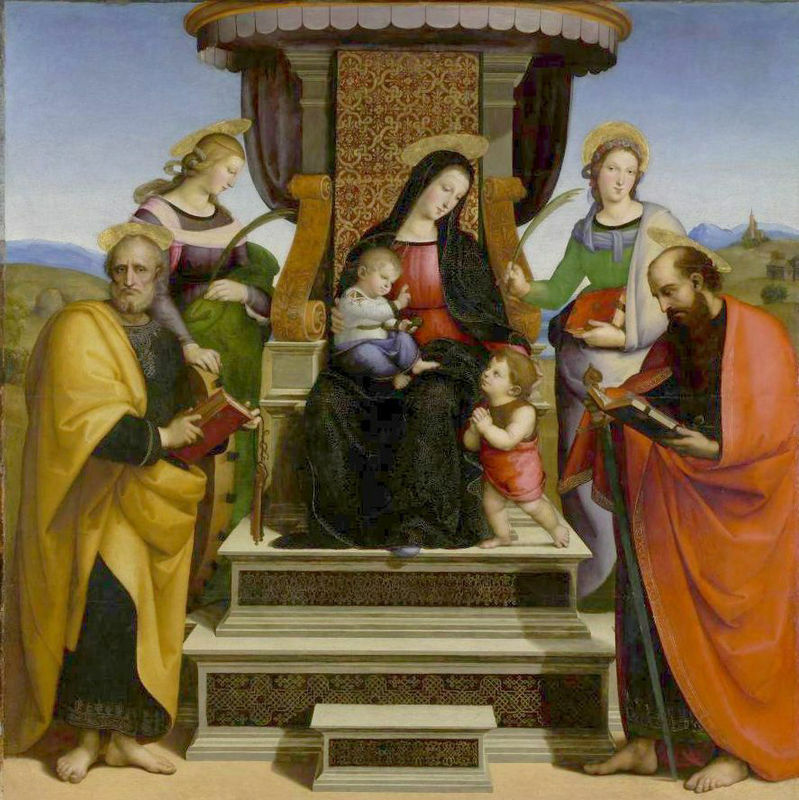 It was typical during the early Renaissance to see paintings of religious or mythological figures, or affluent people wanting their portraits painted. 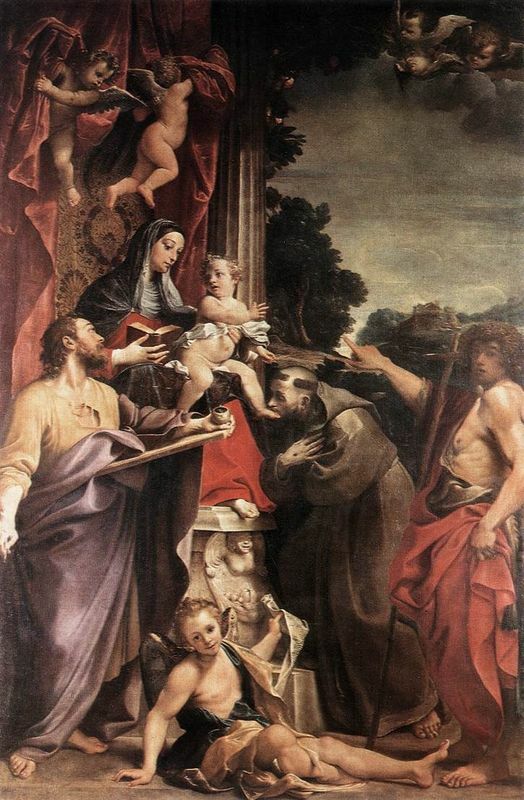 Over time artists like Carracci developed more of an interest in ordinary people and so individuals overtook saints and kings as the focus of many of his works. Bean Eater c. 1583: Carracci's other version of this scene. Annibale Carracci's style is sometimes seen by contemporary viewers as conventional, even stiff or boring. 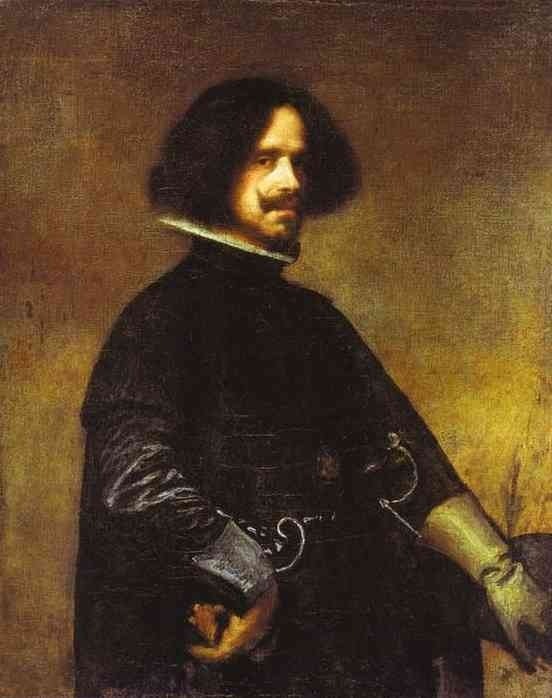 In his own time, however, his paintings were shockingly innovative. Not only did he help to usher in a new style of naturalism into Baroque art, but Annibale also pioneered brand-new subjects in Italian art, like genre scenes and the idealized landscape. When Carracci began executing paintings like The Bean Eater, genre paintings were virtually unknown in Italy. A genre painting is a scene of ordinary people carrying out everyday activities. Especially popular in northern Europe, genre scenes were traditionally reduced to the background of a picture dominated by a different, more suitable theme and typically served to enforce some moral message. In the 16th and 17th centuries, just as poets began to write in the vernacular, artists began to paint in a more natural, realistic idiom. The painted scenes inspired by their surroundings instead of from the Bible or arcane Greco-Roman texts. Genre scenes abounded in Northern art during the 16th century but Annibale Carracci, with his enthusiasm for naturalism and study from life, was one of the first artists to popularize the genre in Italy.